Sydney had one of the world’s largest and most used urban public transport systems. 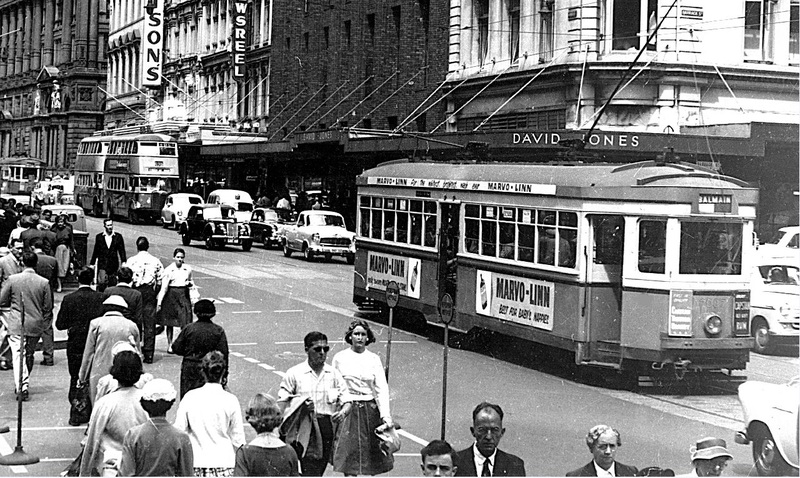 Mathew Hounsell explores Sydney’s old tram system and looks at what inner city councils are interested in resurrecting. In 1945, the NSW Government op­erated the city’s urban transport network as 291 kilometres of sur­face light rail that served 405 million passengers a year, all while making a profit. 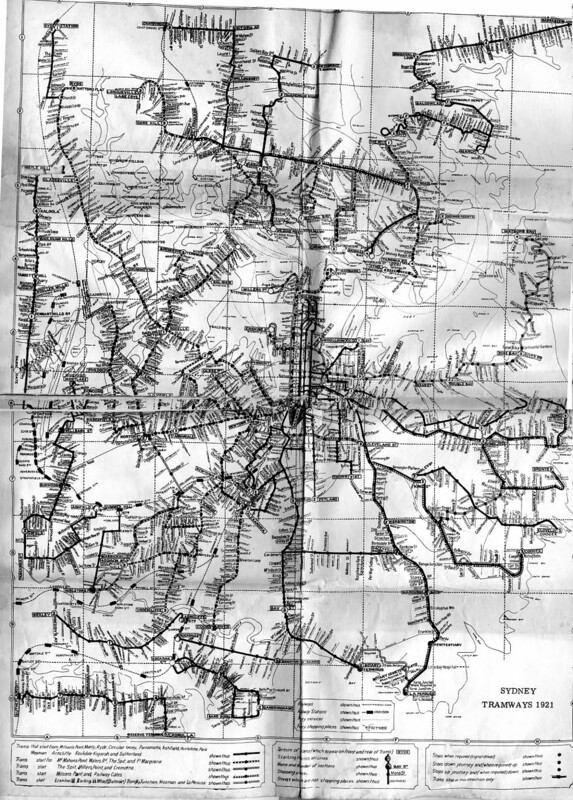 The map below shows the extent of the network in 1921. The history of Sydney’s light rail is a fascinating one. Sydney’s first trams were horse drawn, and later cable cars were introduced along the North Sydney line. It was the flexibility and reliability of electric trams that allowed the tram system to take off and saw the first electric power plants built in Sydney, with spare capac­ity for businesses and homes. The network expanded a few kilometres at a time, like a growing tree, except in some circumstances where powerful politicians decided a tram would improve their local streets. In the east the light rail ran from the CBD to Watsons Bay via New South Head Road; to Bondi via both Grosvenor St and Oxford St; to Bronte (from Bondi Junction) via Bronte Rd; to Clovelly via Centennial Park and Clovelly Rd; to Coogee via Belmore Rd; to Maroubra and La Perouse via Anzac Parade; to Botany and La Perouse via Botany Rd; to Zetland via both Eliza­beth St and Crown St; to Erskineville, Alexandria and St Peters via Mitchell Rd; and it ran cross-country along Gardeners Rd and Cleveland St. There will be major bottlenecks on the CBD and South East Light Rail (CSELR) at Circular Quay, Central, the stadiums, and the racecourse. Restor­ing light rail on Flinders St to Oxford St and then to the CBD would relieve that congestion. The City of Sydney would like to see the light rail restored to Oxford St, as it would allow the city to leverage the CSELR and restore trams to Crown St to service the state’s fast­est growing suburb of Zetland which is a part of Green Square. Waverly Council is also fighting to restore light rail on Oxford St to at least Bondi Junction. They hope to revitalise Darlinghurst and Padding­ton, speed up journeys and ease the noise and congestion caused by this master bus route. Randwick Council is fighting to extend the CSELR in the existing Light Rail reservation all the way past Maroubra Junction. In the west the light rail ran from the CBD to Tempe via King St and Pacific Highway; to Marrickville via King St and Victoria Rd; to Earlwood via Illawarra Rd; to Canterbury via New Cantebury Rd; to Summer Hill by Prospect Rd; on branch lines to Glebe, Forest Lodge, Lilyfield, Leichhardt, Haberfield, Five Dock, and Abbots­ford via the Parramatta Rd trunk; and passengers were carried through Pyrmont to Victoria Rd all the way to Ryde. It also ran through Burwood on Burwood Rd; to Ashfield via King Georges; and to Mortlake and Cabarita. Many people are arguing for the state to restore light rail to Parramatta Rd. The proposal of restoring and extend­ing Parramatta Rd light rail is consid­ered essential by community groups and transport experts, local councils (like Strathfield, Ashfield, and Leich­ardt) and departments like Transport and Planning. Ecotransit’s proposal to leverage the CSELR and the McEvoy St corridor to connect a light rail to the airport has been well received by the community. This version of the group’s Bay-Light-Express has been updated to serve the needs of South­ern Sydney which is transforming into one of the state’s major population and employment centres. In the northern beaches trams ran from Manly via Sydney Rd to Balgow­lah and the Spit; via Pittwater Rd to Queenscliff, Brookvale, Dee Why, Narraweena, Collaroy, and all the way to Narrabeen. In the southern suburbs from Rock­dale to Brighton Le Sands via Bay St; Kogarah to San Souci via Rocky Point Rd; and Arncliffe to Bexley via Forest Rd. Light rail also ran from Parramatta to Castle Hill via Windsor Rd and Old Northern Rd – a route that Parramatta City Council is trying to restore. On the north shore, trams ran along the Pacific Highway to Lane Cove; to Chatswood via Willoughby Rd; to Northbridge via the historic Suspen­sion Bridge; and then on branches to Neutral Bay, Cremorne, Mosman, Balmoral, and the Spit from the main trunk on Military Rd. When Bradfield designed the Sydney Harbour Bridge he planned to use the two eastern lanes for the Warringah Railway – this line has not yet been built. Rather than let the bridge sit idle, the North Shore light rail was taken directly into Platform 1 and 2 at Wynyard. Ever wonder where those boardered up stairs on Platform 5 and 6 lead to? They led to the North Shore trams which carried more people in peak hour during their heyday then the 1960s bridge configuration does today. Those stairs now lead to a car park. In 1949, the government, depart­ments and industry engaged in the largest organised vandalism in our nation’s history. In the middle of the night work gangs would roll in and pour quick set concrete over the light rail lines. The public’s howls of outrage were met with cheers of victory by the nation’s roads and motoring associations. This campaign of destruction was completed in 1961 when the last of Sydney’s trams were taken to Rand-wick tram depot and burned. It is shocking to watch a government take public property, literally rip it apart and burn it rather than risk the public winning their battle to reopen the city’s light rail. For thousands of years, human civi­lisation has developed around dense walkable neighbourhoods. Humans would walk to a local small business when they needed bread or a haircut or a pair of pants fixed. Children could play in the streets and walk to school. Grandparents could walk to the shops and stop along the way to sit and chat to neighbours and friends. Sydney grew around this network of light rail and living streets, expanding along with each line in what today would be called new-wave transit-oriented development. These suburbs today form the ever popular dense inner core of the city. They are popular for one simple reason – they were designed for humans, not cars. It is 6:30pm on the 20 April, it is dark, it is raining, and the temperature is 11°C. An articulated bus pulls up in front of the University of Sydney: students rush to the front door and queue in the cold drenching rain to get on the bus. One person steps on to the bus using the middle of the three doors, as you would in Melbourne, Perth, San Francisco, New York City, or most places in the world. “Oi, you can’t do that!” shouts the driver. It seems a small thing, but the fight for All Door Boarding in Sydney is symptomatic of deep institutional problems in the NSW government and bureaucracy. Say it out loud and the idea that a person should stand and get saturated in the freezing rain while queuing for only one of a bus’s three doors is clearly ridiculous. It is just one very emblematic manifestation of the range of antipathy and hostility towards passengers that exists in the departments of Planning, Roads, Transport, and in Treasury. Occasionally it surfaces as an attack on the very existence of public transport infrastructure and institutions, in the 1950s it was destruction of Sydney’s light rail arteries, today it is the break-up of the city’s rail network. We can only hope that one day soon the government and its public service mandarins have a change of heart and realise public transport is vital to society and the economy.